I Can Not Believe I Get To Do This! After nearly two years of pursuing this crusade to help others accomplish far more than they ever thought possible with their personal finances I still can not believe I get to do this for a living! In less than two years, this thing has went from a mere passion and a book manuscript to a full-service, full-tilt crusade. If you are preparing to teach about personal finances at your church or business organization, I would love to be able to partner with you! It is my passion and call to help people win with their money. Why? Because when people are financially free they are much more likely to go do EXACTLY what they have been put on this earth to do! This stuff FIRES ME UP! Here are options that are available to help you implement a finance curriculum at your church or business. Speaking I love to speak and teach on personal finances. But be ready for a FIRED-UP, high-energy speech as I am more than a little PUMPED to teach people about money management. You can watch me speak HERE. Experiences Some call them classes. Others call them seminars. I call them experiences. Why? Because I teach PRACTICAL tools that can be immediately applied. I do not teach theoretical and hypothetical material. The tools that I teach are what Jenn and I personally did to win with our money. The two-hour experience is the most popular – Financial Learning Experience, but the six-hour Financial Freedom Experience has been very successful too. Group Study Course This six session study is based on my book, I Was Broke. Now I'm Not. I have found that my home group is where I am challenged AND held accountable. Accountability is so huge when it comes to making the tough decisions that might be necessary to win with money. Find out more about the Group Study HERE. Financial Counseling Training In the Financial Counseling Experience, I train people to use the process that we have used here at NewSpring Church to provide one-on-one financial counseling to over 400 people each year! If you are interested in providing financial counseling, this is a great place to start! Since I am an engineer, you can bet that this training will involve a checklist or two. Personal Finance Book In I Was Broke. 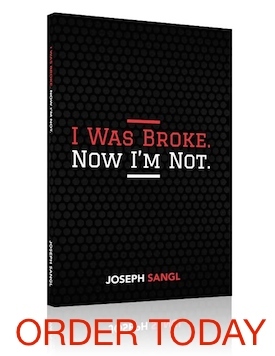 Now I'm Not., I share my family's story of walking out of financial mismanagement and into financial freedom. THEN I share exactly HOW we did it. I share exactly HOW to use the tools and all of the tools are available FREE through the web site. Find out more about the book HERE.